Swizzels Matlow Fun Gum Teeth & Brush containing chewy foam sweets in a mixture of tooth an..
Swizzels Matlow Super Baby Bottle consisting of a fizzy sherbet dip and fruit flavoured lollipop - a..
Swizzels Matlow Mini Sweet Mix consists of a bulk bag filled with a mixture of classic ret..
Swizzels Matlow Giant Love Hearts sweets containing fizzy fruity candies in a bulk box ideal fo.. The original Refresher Bar is a lemon flavour chew bar with a sherbet centre. Each box cont.. Strawberry flavoured version of the classic Refresher chew bar. 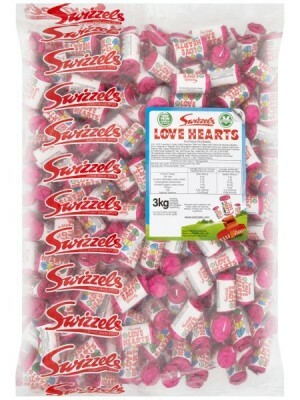 Each box contains 60 bars and wei..
Mini packets of Drumstick Lolly flavoured Squashies by Swizzels Matlow. Ideal for parties and treati..
Swizzels Matlow Drumstick Bars consisting of delicious raspberry and milk flavoured chew bars i..
Swizzels Matlow Fun Gums containing an assortment of different shapes in a variety of fruit flavours..